Roxy Roo (left) is a eight-month-old Cattle Dog / Aussie Shepard /Border Collie / Lab mix who mouthes, bites and pulls on the leash, is needy, eats poop and has some excitement and barking issues. 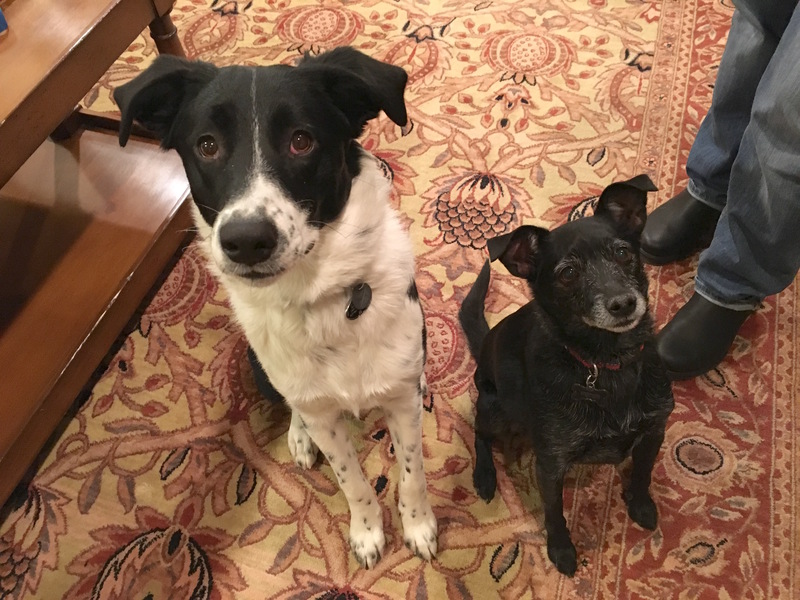 Cooper (right) is a seven-year-old Rat Terrier who also gets excited when guests arrive, over barks at times and doesn’t always listen. It didn’t take long to see that a lack of rules and structure had given this pair of dogs the impression that they has the same authority as the humans they lived with. Cooper growled a bit to disagree with my arrival and Roxy didn’t think it was important to respect my personal space once I sat down with the guardians to discuss the session. Many people think its mean to incorporate rules for their dogs, but correcting and rewarding dogs for doing things we do and don’t like is a big part of how dogs understand what we want from them. Additionally each time we correct or reward a dog, we develop and deepen their respect for us as authority figures. After suggesting some rules and going over some new non verbal communication cues, I inquired as to how much exercise the dogs get on a daily basis. As an older dog, Cooper doesn’t have the energy that his younger counterpart did, although I would not call him a low energy dog either. While the guardians had a great and spacious back yard that the dogs played in, I felt that adding some structured exercise would go a long ways towards redefining the leader follower dynamic. The most basic of constructive exercise is a walk with a dog in the heel position. I asked the guardian to show me how the dogs did when getting ready for a walk. For dogs, the front position is literally the leader spot. So if we start the walk with the dog in front of us, we are asking for trouble. Excitement is another common problem dogs have when getting ready for a walk. But whatever energy level your dog is at before you leave the house is the same energy level you will experience on the walk. So taking the time to get your dog int he right position, mindset and energy level goes a long ways towards a calm and strutted walk. Practicing leashing up the dog and walking to the door with each dog separately will go a long ways towards the dog behaving better on walks. Their guardian told me that due to Roxy’s pulling and excited behavior on walks, she hadn’t been able to walk the dogs together. As soon as she told me that I knew that one of the goals we needed to achieve was to have the dogs walking together calmly in a heel position before we ended the session. Because of Roxy’s abundance of energy, I suggested that the guardian test out taking her to dogs day care for a week. While she surely enjoys playing with Cooper, he is a third of her size which means that she must adjust her play intensity. Being with other dogs close to her size and energy level will give her the ability to play as she would naturally. After a week of dog day care experience, the guardian will have a better feel for how she behaves without all the extra pent up energy. Even if the dog only goes to day care a few days a week, it should make a huge difference with her energy and play intensity at home. Now it was time to address the dog’s behavior at the door when guests arrive. I had one of the guardians go outside so I could guide the other through the door answering ritual. Working with two dogs together can be tough. Adding to the challenge was the layout of the home. Many houses have a narrow hallway that makes it easy to move the dogs away from and control. But because the hallway was spacious and had openings to multiple rooms, the dogs had a definite advantage. The guardian was also a little slow in her reactions which is natural for her first time using this technique. We discussed some changes to her approach and movement and made some changes to the environment to level the playing field before we practiced again. It was great seeing the guardian start to put it all together on the second practice round. Her improved timing made a big difference. One of the dirty secrets of stopping unwanted dog behaviors is to disagree as soon as the dog starts. By the end of the session, the dogs were already showing off their new skills and self control. They were respecting personal space and waiting or asking rather than demanding or taking. This was apparent when I showed the guardian something about the high value treats I used in the session. Now that the guardians know how to better communicate and disagree with their dogs, they will be better equipped to tell them what is expect and what behaviors need to stop. Combined with small changes to their day to day life, the dogs should start to see and identify the humans as having more authority. Once that is the case, correcting and stopping unwanted behaviors will be a snap.